Lofthouse Sugar Cookies are super soft and the perfect sugar cookies for any occasion. Decorate with frosting and sprinkles just like the famous Lofthouse sugar cookie recipe! I have gotten a few questions from friends and readers about the absence of cookies on our blog. I haven’t posted a cookie recipe since December-gasp! I think that is a record. No, I am not mad at cookies, I was just giving everyone a little time to detox from cookie overload in December. I am back today with my all time favorite sugar cookie recipe. These soft sugar cookies are a copycat of the popular Lofthouse Sugar Cookies that you can buy at the store. Homemade cookies are always best, so skip a trip to the store and make a batch of sugar cookies at home. These sugar cookies are easy to make. You do have to chill the dough, so make sure you plan ahead. 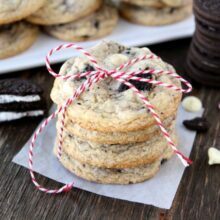 There is sour cream in the recipe which keeps the cookies moist and soft. You can cut the cookies in whatever shapes you like, I chose hearts because Valentine’s Day is right around the corner. Feel free to use your favorite cookie cutter shapes. The buttercream frosting is fluffy and compliments the cookies nicely. 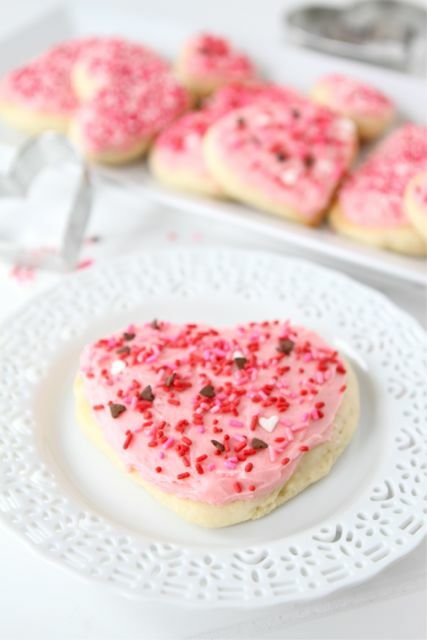 I made pink frosting and added Valentine sprinkles to dazzle up my heart shaped cookies. These super soft sugar cookies are perfect for any occasion. I usually make them for Christmas and Valentine’s Day. Get the kids involved and let them help roll out and decorate the sugar cookies. The unfrosted sugar cookies freeze well so you can make them in advance. The frosted cookies will keep in an airtight container for 3-4 days on the counter. Lofthouse sugar cookies with buttercream frosting. 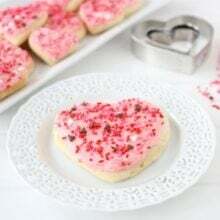 These soft and fluffy sugar cookies are perfect for Christmas, Valentine's Day, or any occasion. In the bowl of a stand mixer, cream the butter and sugar together at medium speed until light and fluffy. Add the eggs, one at a time, beating until each is incorporated. Add the vanilla extract and sour cream and beat at low speed until combined. Add the dry ingredients and beat at low speed until just combined, scraping down the bowl as needed. Dough will be a little sticky and that is ok. Divide dough into two sections. Flatten into rectangles about 1½ inches thick, then wrap with plastic wrap. Chill in the refrigerator overnight or for at least two hours. Preheat the oven to 425 degrees F. Line large baking sheets with parchment paper or Silpats; set aside. Lightly flour the countertop and the top of the dough. With a rolling pin, roll the dough out to ¼-inch thickness. Using cookie cutters, cut out the cookies and place on prepared baking sheets. Bake for 7 minutes, until cookies are slightly golden around the edges. Immediately transfer cookies to a wire rack to cool. Cook cookies completely before frosting. To make the frosting, in the bowl of a stand mixer fitted with the paddle attachment, cream together the butter and vanilla extract. Slowly beat in powdered sugar and the pinch of salt. Once smooth and creamy, add in heavy cream, 1 tablespoon at a time, then beat at medium-high speed for a minute or two until light and fluffy. Add food coloring, if desired, and beat until combined. These are such a cute Valentine’s treat, so very pretty! I love lofthouse sugar cookies and had a package in my hand over the weekend but had seen recipes on blogs lately (and now your post!) which convinces me to just make them, not buy them. I made pink cookies with white frosting today…next up, white cookies with pink frosting like yours! Agree with you – both that homemade are better than store-bought, and that cookies are the way to people’s hearts. 🙂 Glad the cookies are back, Maria! Though, I do love your savory and lighter recipes, too! That is so funny that people were wondering what happened to the cookie. 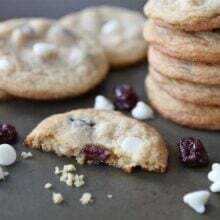 It just goes to show that people depend on you for good cookie recipes..FACT:-) These are awesome cookies and yours are so cute that I am going to make these next Saturday with my girls. I will have to get some chocolate sprinkles though because those totally pop amongst the sparkly sugar. These would be dangerous in my house! haha- I hadn’t even noticed the lack of cookies! Sugar cookies…are my favorite cookie! I know- so odd, but I just love them to bits. Especially when they’re huge and super soft! Hope you, Josh and your adorable little man are doing well. sometimes nothing hits the spot like a sugar cookie, and these are DEFINITELY on my radar now! drool! I always loved those cookies! Especially the lemon ones they would have sometimes! Oh I have to try those, I always drool over them in the store, but never buy them. I’m going to have to make these and soon! Little Buddy absolutely loves soft sugar cookies like these! I’m a sugar cookie fanatic- so these are perfect for me. So pretty! These are my downfall – I know they wouldn’t survive long in my house!! There’s nothing like a good frosted cookie to make a girl happy as a lark! These look delicious; just the type of thing I should not see today while starting the juice diet!! I am way too excited about these. They need to happen in my kitchen…TODAY!!! Love that you made them heart shaped! My sons are going to love these! They were begging for those at the store yesterday. Thanks! Those are cute! I bet they are tasty as well. Love these!! Looks so yummy. Oooooooh, yum! These look beautiful and delicious! Yum. My kids love these type of cookies and always beg for them from the store. I hate to buy them because they taste good but probably aren’t. They’ll be pumped to see these on the counter one day when they get home from school. Thank you. Mmm, nothing beats a perfect sugar cookie! wow, these are JUST like the ones you buy in the store!! I swear I leave drool marks every time I walk by. These look awesome, nice work! Heart-shaped cookies can only be a good thing. These look perfect! Beautiful and perfect for valentines day! I’ve seen a lot of versions of these over the past few months but I dare say this pretty-in-pink version is my favorite! YUM! Your cookies always look so delicious. I love cookies and might just have to try to come up with a gluten free version of these. 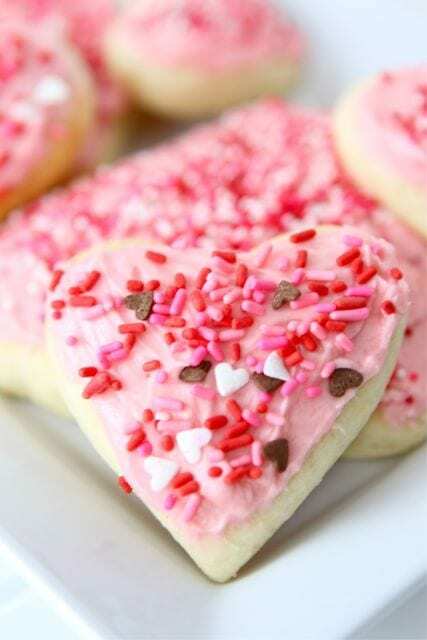 These would be the perfect cookies to take into my boys’ school Valentine’s parties. So much better than the store-bought ones! Maria, these look so pretty! I am sure they taste delicious 🙂 I am going to frost mine with strawberry buttercream. Your cookies are so pretty!! I loved this recipe when I made it, need to make it again! I can’t wait to try this recipe – I just might start as soon as I get home! I have tried several different recipes that claimed they were “Lofthouse-like” cookies that turned out completely different. Thanks for posting it. Love your blog! These would be great cookies for a Drop In & Decorate cookies-for-donation event! these just may be the prettiest cookies ever! Delicious cookies! I’m glad I stopped by at the perfect time to try one of these. I think anytime is the perfect time to stop by your kitchen. You’ve always got something tasty to offer! These cookies look beautiful and delicious! super cute! excited to see you this week!! We love soft sugar cookies! These sound great, and look perfect! Oh man, I’m really craving some sugar right now and these cookies look SO delicious. I can’t wait until next month when I can make some! 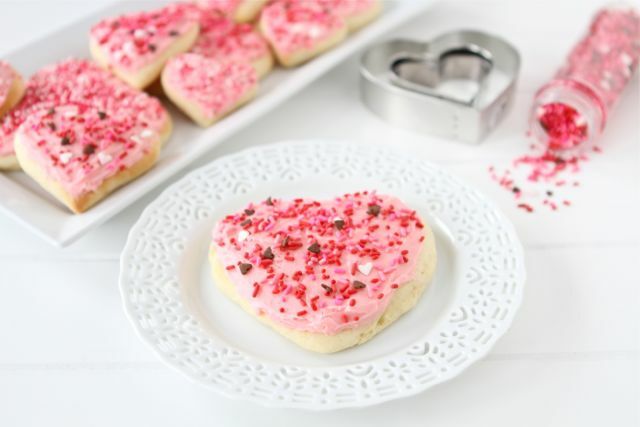 More than 2 weeks without cookies is just craziness 🙂 These look delicious, I love soft sugar cookies and I’m sure these would make all the hearts in my house grow fonder of me! These look so cute and delicious! My girls love these kinds of cookies, so I’ll really need to give this a try! These are adorable! I need to make a batch and let the kids go crazy with the sprinkles. Then head for the hills until the sugar high is gone! Oh, those are beautiful! Must make ASAP – thank you! i have yet to make lofthouse! ack! I feel so behind on that. January and February are some of the BEST months of the year because of all the PINK and red, and hearts floating around all over the place for Valentine’s Day! Super cute cookies! Happy Valentine’s Day to you and your darling family. We are big fans of the soft sugar cookie. This may just be your son’s favorite in time. Sprinkles seem to grab a kid’s heart. (or a big kid like me). Such a pretty and fun cookie for Valentine’s Day! those are so pretty, Maria! I love, love, love Lofthouse sugar cookies. They tempt me every time I pass them at the grocery store. I’ve meaning to try a copy cat recipe for a while, thanks for the reminder! OMG, I will have to whip up batch of these on my day off this week. I adore these, but knowing they come in frozen and are thawed to be sold has turned me off quite a bit. I have just the sprinkles to make a batch too! These cookies are adorable! I love soft sugar cookies too. I’ve been looking for agood recipe for a while now. Do you know a dairy free substitute for the sour cream? I have a son who has allergies. I have substitutes for the other things. Can you use a dairy-free sour cream or plain yogurt? I can’t wait to make these! My sisters are getting the ingredients I don’t have tonight! Wooohooo! Made these today and they are absolutely delicious!! The recipe is very easy to follow. i did have to halve the recipe since it’s only me, my husband and my little one. Thanks for posting this recipe! It is definitely a keeper in my house. Yum, Maria. And this was probably the first time these were ever made without Crisco!! I bet they were delicious! You can use milk if you don’t want to buy the cream. Enjoy! These look so yummy! I just made the dough, but just wondering, do you think the frosting could be made ahead as well? Yes, just let it come to room temperature and stir before frosting. Enjoy! I had troubles with the dough being so sticky. So I had to add a lot of flour while rolling them out so they got a little chewy. Still tastes great though! Was it supposed the dough supposed to come out bread like? Because my cookies turned out to be biscuits. No, the cookies should be soft and fluffy. My daughter (adult) and I are in awe. We call the Lofthouse Sugar Cookies “Jesus Cookies” because they are so soft and wonderful that Jesus must make them. Now to have the recipe. We are pumped! I made these cookies this weekend. I thought the dough was too hard to work with…very sticky…i used a ton of flour to keep it from sticking together! The frosting was too whipped like also. 🙁 They are good tasting…I just wouldn’t want to bake them again! question i dont have parchment paper 🙁 does anyone know if these will work if i just grease the pan?? i already made the dough and cut out the cookies…. Grease the pan well and you should be fine. I attempted to make these. Before I refridgerated them they were extremely sticky. But the recipe said that was okay. So I left it, figuring they’d firmup. They were just as sticky after 12 hours or refridgeration. So I took them out and tried to knead flour into the dough after adding a half cup of flour (to 1/3 rd of the batch) I gave up hope. They were still to sticky to roll. Any advice? I love Lofthouse and was looking forward to them tonight. The dough is sticky, but you should still be able to roll them out. Make sure your flour is well floured before rolling. 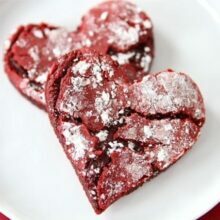 I made these as Valentines and they were better than any store bought cookie! They were perfect! Finally got to cooking these last night (after letting them sit in the fridge overnight) and they came out a bit sour cream tasting…not quite spot on for a Lofthouse-although the texture was pretty good. I’m wondering if part of my issue is the lack of a stand mixer. I get so tired of seeing everything call for a stand mixer and decide I can manage without….as surely scads of women did before they were invented. But it rarely comes out as I hope. Added a couple tablespoons of berry jam to the icing along with some food coloring and extra sugar to help it stay stiff for stacking. They look lovely and taste wonderful, especially if you don’t want cloyingly sweet. Bringing them to work tonight along with the red velvet crinkles. Yep, made these and LOVE them! Been searching high and low for a good recipe for these since visiting the US last year, no where in the UK sells the things and other recipes from the Internet just haven’t tasted right so thank you for this one as its perfect! Glad you liked the sugar cookies! Pingback: Soft Sugar Cookies (Lofthouse Style) | Bake Break! These are the best soft sugar cookies I ever made! I used this receipe for Easter cookies. They are easy to make, my 4 y.o. daughter had a blast cutting them out and decorating. We got tons of comliments! and they absolutely delish! Thak you you for sharing this wonderful receipe! Just wondering if you think you could freeze half of the dough? Thanks! I haven’t tried it, but I am sure it would be fine. Just let it defrost on the counter before rolling. Made these and while they look like the lofthouse they DO NOT TASTE LIKE THEM! This was not a good recipe. I love your recipes! Thanks for sharing!! 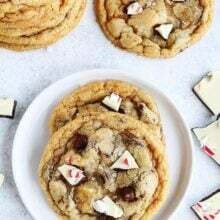 I want to make these for my cookie exchange – do they freeze well? I freeze them before I frost them and they freeze beautifully! sitting down with these cookies right now. they turned out beautiful and taste wonderful. love the richness of the buttercream made with cream. thanks for sharing. these will become a staple. I made the dough – left it in the fridge all night & it is still too sticky to roll out & cut any ideas that might help??? How long can you store the lofthouse in a airtight container? Can you store the frosting in the fridge? I would say 3-4 days. Yes, you can keep the frosting in the fridge. The cookies freeze well too. I don’t frost them and put them in the freezer. Wondering about the last sentence of instructions, “Cook cookies completely before frosting? ?” Is this a problem!?! *lol* Too cute! Can this recipe be halved ? My cookies are coming out tough and “bready” do you have any hints? Am I mixing them too much?? Should I let them be stickier than doughy?? Please HELP!! I have a big valentines day order and I can’t figure it out!!! I’m making these with my kids, they’ll love them!! Wow! These are so good! THANKS! These are so great! My family loved them, I wouldn’t change a thing. They are perfectly not too sweet. These beautiful cookies look delicious and tempting and were fun to make! BUT they taste terrible! We were so disappointed that I only cooked one sheet and tossed the rest of the dough in the trash 🙁 What a bummer! Can you cut the recipe in half please and send it to me? I made the mistake of making these without the frosting (only sprinkled sugar on top). They are not that kind of sugar cookie. I liked the texture a lot. I was wondering…if you wanted to forgo the frosting, could you just add more sugar to the recipe to make them sweeter? I always frost the cookies, but if you want them sweeter you can try adding more sugar. I haven’t tried it though. Hi I am thinking of making these for my daughter’s 6th birthday party. Just wondering how far in advance i can make them – cookie and frosting completed and assembled ? Does the frosting harden on the cookie so cookies can be rested upon each other ? You can make them up to 2 days in advance. Just make sure you keep them in an air-tight container. The frosting will set up a bit, but I would still put a piece of parchment or wax paper in between the cookies if you are going to stack them. Enjoy! all i have is salted butter…will that work?? Sure. I usually bake with unsalted butter but if that is all you have it will be fine. Pingback: Homemade Lofthouse Sugar Cookies | Mommy May We? I refrigerated overnight and they are still super sticky??? Really sticky, sticking to everything. Where did I go wrong?? Then we tried one – albeit without frosting. They had a nice texture, a little denser than the lofthouse but not bad. The taste however just wasn’t there. It was quite bland in comparison to lofthouse. I was thinking that next time I would add some almond extract and try to beef up the flavor of the cookie. Overall, it just tasted like flour. I’m wondering if the frosting really adds THAT much flavoring to the cookie, so as to compensate for the lackluster cookie… but if that’s the case then perhaps this isn’t the cookie recipe for me. I’m not sure if I want to make icing with the possibility of the cookies just being thrown away or not. Does the icing really cover up the bland cookie base? I was really afraid to make these since the reviews were all over the place but my batch turned out pretty good. My 6 year old and husband helped me decorate. We had a blast! I do have a few suggestions–next time I will halve the recipe. It made a lot of cookies for just the 3 of us. I did freeze some unfrosted ones. Also, I do not have a stand mixer (I’m cheap:-). It was a beast with the hand-held mixer so I had to finish mixing by hand. But with half the recipe it should work. I’m not sure they taste exactly like Lofthouse but they are pretty darn good! Besides without all the preservatives, they shouldn’t taste exactly the same anyway! Can you freeze the dough and for how long? Or should I bake the cookies, then freeze them for a week or two until ready to frost and eat? I would bake the cookies and freeze them…but don’t frost them. Frost after they defrost. Pretty unimpressed with this recipe and I don’t recommend it. If you really want to try it for yourself, here are some tips to make them palatable and keep you from wanting to choke a couple of Santa’s elves. 1. Refrigerating overnight isn’t necessary and won’t get the dough cold enough anyway. Put it in the freezer for 30-60 minutes. 2. When you’re ready to bake, cut enough dough for one batch and put the rest back in the freezer – again, fridge isn’t cold enough. 3. Don’t bother rolling this dough. It’s way too sticky and miserable to work with. It warms up REALLY fast so you’re better off just flattening with your hands in small batches. 4. Don’t flour the dough when you’re ready to roll or pat it out to cut. This dough produces a really bland cookie and adding more flour won’t do it any favors. Instead, use confectioners sugar. It works just as well as flour and will improve the taste a bit. 5. When you roll/pat and cut the dough, do it on the parchment paper and pull up the scraps instead of pulling up the cut cookies. Then just transfer the parchment with cookies onto the baking sheet. This will improve your chances of having the cookies retain their shape. Made these today, and they came out perfect looking, but I agree with the other posters who said how bland they are and too bready in texture. They’re close, but nowhere near a home run. I just made these with my grandson. Delicious and great memory maker! http://www.lookinginmyrearviewmirror.com I will put a post with pictures later this weekend. Watch out they are extremely addictive! I made these tonight. First of all, I think it’s worth mentioning that if you don’t have a 6 quart mixer, you should consider cutting the recipe in half. These are a fair representation of the soft Lofthouse cookie, with a couple exceptions. The crumb (texture) is a little off. To their credit, they do keep their shape well if you work with the dough while very cold. I put my sheets in the fridge for a few minutes before baking. I also as adjusted the flavor extracts. Both the cookie and the frosting should have both vanilla and almond extract. I also add a smidgen of butter and coconut extract to my butter cream. A recipe worth tweaking. totally not a lofthouse cookie. Cookies were so big and bloated. unhappy I wasted my $$ on thus recipie.they were so sticky.they rolled like a biscuit and look like them too.ugh.fail. Do you think you could use plain unsweetened greek or regular yogurt in place of the sour cream? Pingback: BAILEY’S IRISH CREAM COOKIES + DARK CHOCOLATE | Adventures with Em. Just made this recipe for my kiddos and my cookies turned out more like mini loaves of sweet bread lol..I am not the best baker, but I did follow the recipe..what could I have done wrong or is that how they are supposed to turn out?? Did you roll the dough out enough? When halfing this recipe should I add two or three eggs??? These sound fabulous! Should there be too many for just the two of us, do they freeze if not iced? If not, I will take some over to the little kids next door!! I tried making these yesterday, but unfortunately, they tasted like nothing and the batter was far too thick. (Yes, I followed the recipe exactly.) The finished product was hard and lumpy. I would have liked to give this a favourable review, but it was a disappointment. Does anyone know if this dough freezes well? Very disappointed with this recipe. Followed exactly and while they taste fine, the dough was Very sticky and impossible to use cookie cutters! I even refrigerated dough over night. Had to use flour just to roll in balls and make cookies. Just want to warn others who stumble upon this recipe. I was scared at first from the mixed reviews but I’m so happy I made these! So delicious my family and friends can’t eat enough of them, looks like I will be making these again soon. One thing I noticed was people were complaining about the stickiness of the dough. The unsalted butter I used was still a little cold (room temperature is pretty cold in a Canadian winter) and noticed no crazy stickiness – in fact the dough was perfect! Is it possible to freeze dough and use later? I’ve made lots of these before, and wasn’t a big fan of this recipe. I made these as drop cookies rather than cutouts because the batter was too soft to roll out, and they turned out very badly–some burned with the oven that high, so I had to make them a lot smaller. I’ll definitely use another recipe next time. does anybody know if the Carrot sugar cookies are truly “seasonal as Walmart is trying to tell me? What season is connected to carrot cookies??? Warning!! This recipe was a waste of time and money! I’m an experienced cook and followed the recipe perfectly. The dough was so sticky, it was impossible to work with, even after chilling overnight. I ended up not cutting the shapes out but rather rolling the dough in balls then squishing down with my fingers b/c even using the bottom of a glass didn’t work, since the dough was so sticky!! Then when they came out they tasted and had the texture of pancakes. After research of other simple recipes, I think the above recipe has incorrect measurements, esp. the sour cream, which I think should be 1 cup, not 1 1/2 cups. Overall huge disappointment and waste of time given I’m a FT working pregnant Mom of a toddler! Yes, you can freeze the dough or the cookies. Can the dough , once cut into shapes, be frozen? The frosting is horribly sweet. I had to throw the batch in the garbage no matter how much I tweaked it. I am curious if your cookies are processed in a plant that handles nuts of any sort. Made these today and agree with the dissenters: they were super bland and not very cookie-like. My husband suggested keeping them for strawberry shortcakes, although a few may end up being served as actual biscuits. Now to find something else to make for our potluck tomorrow…. This is my go to recipe for shaped sugar cookies! The best with and without frosting…i use royal icing. My husband is enjoying this as I type and he said to thank you from him. Looks so fresh and crunchy and creamy all at once. Another winning recipe from twopeasandtheirpod !! Thanks a tonne for this, it made my day. I have been making these cookies since the 1970’s. Recipe came out of a kitchen aid mixer book! It isn’t Christmas without them! Help!! I think my dough is too sticky It kept sticking to the rolling pin, the cookie cutters an even the counter top. What should I do? Seriously the BEST sugar cookie recipe ever!! So easy too!! Thank you!! I’ll be making these a lot more often now! How do I make/get pink frosting? If I didn’t want to use a cookie cutter, could I scoop out the dough onto the cookie sheet and just bake? Dough is chilling in fridge right now. Can’t wait!